1. 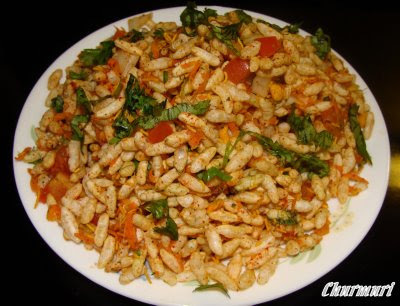 Take puffed rice in a mixing bowl and add peanut, chilli powder, chat masala, ½ cup sev, onions, tomatoes, grated carrots one by one. Mix them. 2. Now add mint chutney, tomato ketchup, lemon juice and mix well. Finally add cilantro and ½ cup sev on the top. 3. Serve immediately with hot tea or coffee.